Weekends have become a bit odd in our house. While others are settling down to a couple of days of extra sleep, frantic last minute Christmas shopping, and good food, my hubby is waking early, scampering to work and eating out of a pack. I try to brighten his lunch pail with something a bit “surprising”, but let’s be honest: a pail is still a pail. I could go all bento on him, but he has simple tastes and I wouldn’t want to force food on him that he doesn’t like just because it’d make my culinary heart sing. In the photo on Adrianna’s blog, she has my favorite strawberries mixed with sugar and lemon. I would have loved to have topped my soft, flaky biscuits with strawberries but, sadly, they’re out of season and much too expensive. I dug around in my freezer past the rhubarb (I didn’t think hubby would be quite so keen on that), past the raspberries (although I did keep them in mind in case I didn’t have anything else) and took out the blackberries. I boiled a bit of water (1/4 cup), some splenda (2 packets), half an orange, a splash of vanilla (1 tsp) and a sprinkling of potato starch (1 tbsp) and 15 minutes later, I had a compote that paired wonderfully with the chocolate in the biscuits. In a large bowl (or plastic bag), mix flour, cocoa, splenda, baking powder and soda, and salt (shake bag to mix and pour out into a large bowl). Add chopped chocolate chips. Using a large grater, grate the butter into the bowl. Mix the butter into the flour with your fingers until it resembles small peas. Chill in fridge about 10 minutes. Melt chocolate in a medium bowl (I used the microwave). Set aside. Whisk together your egg, “buttermilk” and yogurt. Slowly pour the mixture into the chocolate as you whisk. Whisking will help the chocolate from seizing up and turning solid. The resulting mixture should resemble chocolate milk. Some dairy lumps will still be visible and that’s fine. Pour the liquid into the flour mixture and mix with a wooden spoon until just combined. Turn out onto a lightly floured surface and knead 5-6 times. Pat dough down into about an inch thick and cut out rounds. Place rounds on lined cookie sheet and set sheet in fridge to chill. Place sheet into oven and bake for 10 – 15 minutes. Her recipe called for 15-17 min but my oven’s temp must be off a bit. 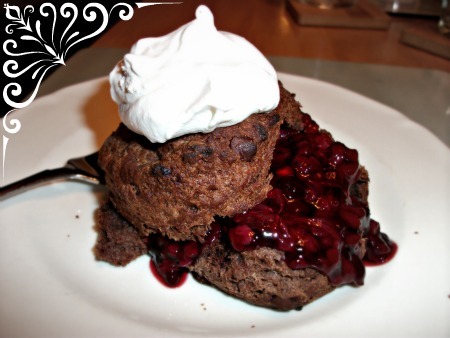 Categories: Musings | Tags: blackberries, chocolate, dessert, Recipe | Permalink.